I am a mom, a wife, a nurse and a friend. I have 4 kids, 3 in college and one in high school. We are rebuilding our world after a house fire and moving forward with our busy crazy lives. When all is said and done, family is everything and stuff is just stuff. We recently had a house fire and lost everything. Given the world today, devastating hurricanes, out of control wild fires and record breaking floods, losing everything seems to be going around. Our go to when we are feeling the weight of it all is that family is everything and stuff is just stuff. There is always someone or something worse than what we have gone through because in the end we still have each other. Sounds corny, right? It really is the cheesiest line ever, but I am telling you from experience, surround yourself with the people who are everything to you and remember those who are not as fortunate. Remember in the end, you get what you give. Be kind. New iPad Pro for my son to use for school. We have been able to replace an iPad without going into further debt all at once. If you have questions, call customer service is incredible! 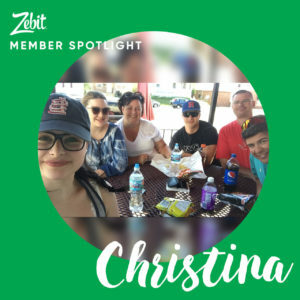 For being chosen as Zebit’s Member Spotlight, Christina selected a $50 Lowe’s eCertificate.